The tap is a simple but genius piece of design. You turn a handle one way and water flows. You turn it the other way, and the water stops. The bathplug is even simpler. You find a pliable, waterproof substance and cut it to fit exactly into the hole out of which the water flows, and you equip it with handle or chain on top that you can grasp to remove it. "A lot of attention in the design world is focused on creating products that are intuitive and easy to use, but sometimes a little ambiguity can be a good thing. Designed for use in restaurant and hotel bathrooms these taps embrace ambiguity to create a sense of intrigue to provide a more engaging interaction." Hmm. Ambiguity is not really what I'm seeking in a bathroom. And engaging isn't the word I'd use for my interaction, as I try turning, pressing, pulling levers and dials and waving my hands around under taps. It usually ends in quite a bit of swearing. And that's in the cases where I can actually find something to push, pull or turn. Hotels in the old Soviet Union had a simpler approach to frustrating their guests - they just didn't provide a bath plug. Dorothy - the real challenge is how to work the hotel shower when the only possible source of water is via its attachment to the bath. I think you could do the scientific conference-going community a service by posting all the possible ways in which you can redirect water from the bath to the shower. Most of us will have been defeated at least once by this engaging ambiguity. I usually have opposite problem, as I like a bath, but when I turn on the tap, water cascades from the shower over my head. Bath to shower usually involves pushing a lever or whatever in upward direction, but of course the problem is finding what to push. I once saw a man come down to reception dressed only in a bathtowel to complain about incomprehensible taps, but I guess he had more nerve than most of us! I'm with David on the 'Joys of Hotel Showers', whereas the heuristics of the average tap has been virtually unchanged since the Victorian times. Therefore, when I've stayed in a hotel room, I've often opted to run the bath (having paid enough for the room in the first place, it is rude not to). 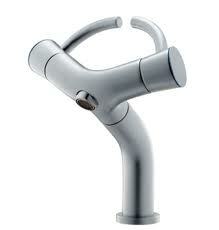 Then you look at today's fitted kitchens and bathrooms, and find the Supertap Tyranny has taken over. This phenomenon isn't the sole preserve of boutique hotels. nice but wired what if your in a bloody rush you'll turn them both side ways hehehe i find it cool abd funny. Ooh it's a shame that the site you linked to is no longer available. Does anyone else find that the less obvious the operation of a tap is the more likely it is to have been damaged? And the sleek minimalism of many a washroom is compromised by laminated instructions for use of taps that are taped to mirrors. Please remove my comment from this blog.